Need a quick dinner idea for dinner one night? 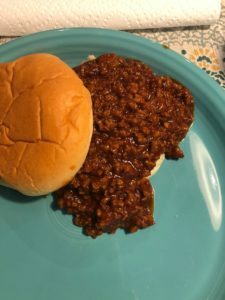 Consider trying these Super Delicious Sloppy Joes. Literally the Best Sloppy Joes i have ever had. These were even a hit with my 2 picky eaters!!! I omitted the Onion and Green Pepper, and used onion powder instead. My kids wouldnt of touched it if there were onions and green peppers in it! In a medium bowl, stir together the ketchup, chili sauce, water, vinegar, brown sugar, chili powder, cumin, mustard, red pepper, worcestershire and tomato paste and set aside. Heat the butter in a large skillet over medium heat and add the onion and bell pepper and cook until softened, about 3 – 5 minutes. Add the garlic and cook another minute or two. Increase the heat to high, add the ground beef and cook until browned, breaking it up well with a wooden spoon as it cooks. Drain off the excess fat. Stir in the liquid mixture, generously salt and pepper and bring to a boil, then reduce the heat and simmer for about 15 minutes, or until thickened. Serve on toasted hamburger buns with mustard, pickles and cheese if you want. Let us know how you liked these super delicious sloppy joes!